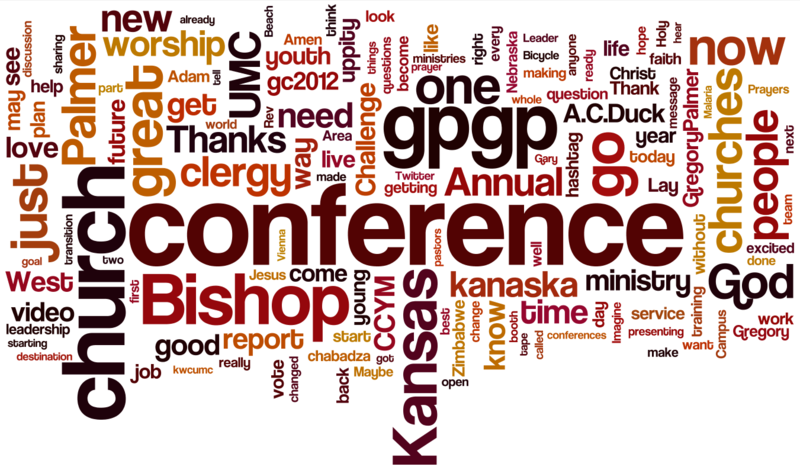 As a follow up to the The #gc2012 Twitter Word Cloud Project, I completed a similar project for the Kansas West Annual Conference. I collected Twitter updates from May 22 to 27 that were tagged with #kwc12, #ksw12 and #kswumc. Then I used Wordle to create a word cloud with the text of all the updates for the conference. I edited out Twitter usernames, #kwc12, #ksw12 and #kswumc to get a better view of the conversation. I hope that you enjoy the results! You can find the raw data of Twitter updates tagged with #kwc12, #ksw12 and #kswumc at http://j.mp/LlgkSN. Feel free to use these updates and World to create your own word clouds. I appreciate both of these posts from Leading Ideas – Mutual Mentoring and Leaders Stay Young. A good question is raised at Should the Church Have More in Common with Apple? This is a decision of a particular denomination in a particular location. What are your thoughts, feelings or opinions about sacraments via electronic communication? I just finished reading Flickering Pixels: How Technology Shapes Your Faith by Shane Hipps. After just finishing the book I felt thoughtful, peaceful, powerful, aware and enlightened. This book was an unexpected breath of fresh air into my life. Hipps is a Mennonite pastor in Arizona who formerly worked in advertising. He has a distinct perspective on media and how it shapes the way that we think. Hipps suggests that the book is about “training our eyes to see things we usually overlook” (14). Hipps is a proponent of Marshall McLuhan’s phrase – the medium is the message. Hipps helped me to think critically about the media with which I engage in every day. I am more aware of the effect that the medium itself has on me as well as any given content. Hipps ranges across a wide variety of topics within the field of technology and faith. After addressing media, images and how our brain learns and process information, he makes a clear connection with God. God communicates in many different ways with God’s creation and in a very real sense the medium is the message, particularly in the person of Jesus Christ. I unequivocally recommend this book to those who seek to be more aware about the infoluence which technology has on life and faith. I have heard it said that communication is difficult across the annual conference as there are many different ways that people communicate and there is not a single best way to communicate. I believe that there is a hint of truth here, but that it could be addressed relatively easily. I propose that both the Kansas West and Kansas East Annual Conferences take seriously the need to communicate and make improvements in the efficiency by which it is done. To that end, I propose that every church in the conference have a computer and high speed internet access. Broadband is spreading across rural areas and could be also facilitated through services like WildBlue. This would level the playing field of communication technology and allow communication to move toward standardizing via email and other electronic means. Will this take time? Yes. But I believe that creating a benchmark of technology for each church could increase communication and over time make things like annual reports much simpler as they could be completed electronically. Not being able to communicate is a myth of the annual conference.